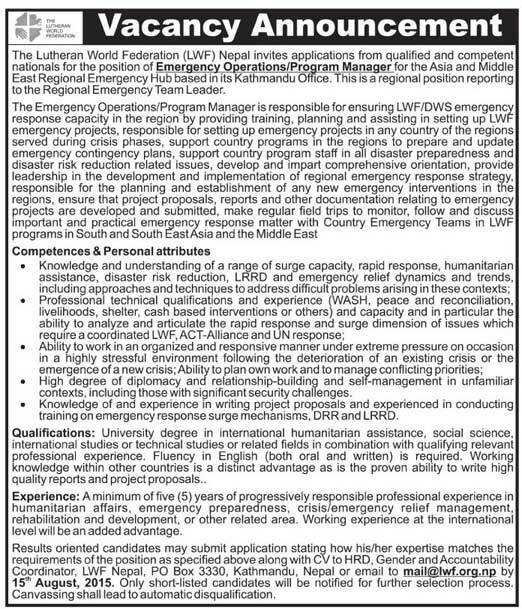 The Lutheran World Federation (LWF) Nepal invites applications from qualified and competent nationals for the position of Emergency Operations/Program Manager for the Asia and Middle East Regional Emergency Hub based in its Kathmandu Office. This is a regional position reporting to the Regional Emergency Team Leader. Qualifications: University degree in international humanitarian assistance, social science, international studies or technical studies or related fields in combination with qualifying relevant professional experience. Fluency in English (both oral and written) is required. Working knowledge within other countries is a distinct advantage as is the proven ability to write high quality reports and project proposals. Experience: A minimum of five (5) years of progressively responsible professional experience in humanitarian affairs, emergency preparedness, crisis/emergency relief management, rehabilitation and development, or other related area. Working experience at the international level will be an added advantage.